A compact, lightweight, ergonomically styled Super Gen 1+ night vision gun scope with all-metal bodyshell. External windage and elevation controls are built-in (1 click=6mm@50m). The Rapier™ features a ‘German sniper scope’ type 3-bar reticle. The built-in mount is an adapted Weaver that can be closed down to 9.5mm. The internally focussed 64mm f1.2 lens offers 1.7x magnification with a 17° field of view. Focusing is by front lens and rear eyepiece adjustment. Power is provided by 2 x 1.5V Alkaline AA/MN1500 batteries (not supplied). A powerful built-in 75mW Infrared Illuminator has 3 power settings and a variable beam with power being supplied by the scopes batteries. An optional 2x Lens Converter doubles image magnification to 3.4x with a slight loss of light amplification. A well-featured, weatherproofed budget-priced Gen 1 night vision gun scope with all-metal bodyshell. Internal windage and elevation controls are built-in (1 click=15mm@50m). The lit reticle aiming mark is a crosshair with central + and has a manual brightness control. 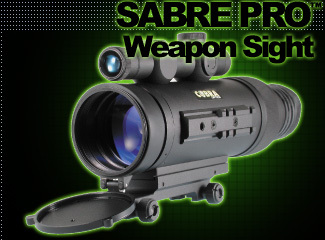 The Sabre Pro™ is fitted with a Weaver mount. The 80mm f1.6 lens offer 4.0x image magnification with a 9° field of view. Focusing is by front lens and rear eyepiece adjustment. Power is provided by 1 x 3V Lithium CR123A battery (not supplied). The Sabre Pro™ features both LED ‘On’ and ‘IR On’ indicators. A short-range Infrared Illuminator, with two power settings, is built-in and powered by the scopes battery. The optional 7012 High Power 75mW and 7011 150mW Infrared Illuminators can also be fitted via an accessory shoe on the left-hand side to give improved performance in very low light/total darkness.